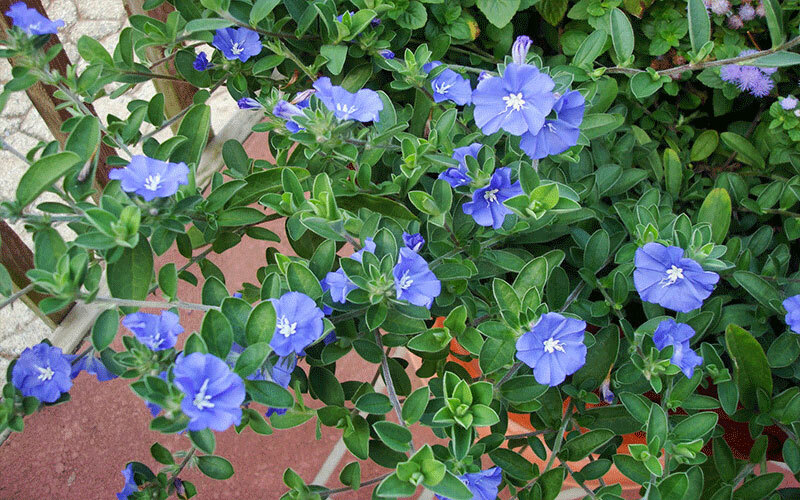 The Blue Daze, is a pleasant evergreen shrub that grows low to the ground. 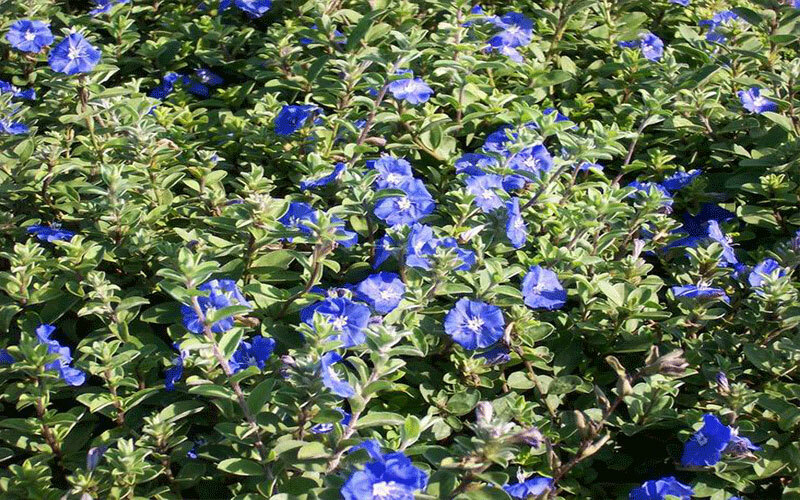 When mature, each plant will spread 2 to 3 feet and reach a height of 1 foot and it's pleasant blue flowers will bloom throughout the growing season. 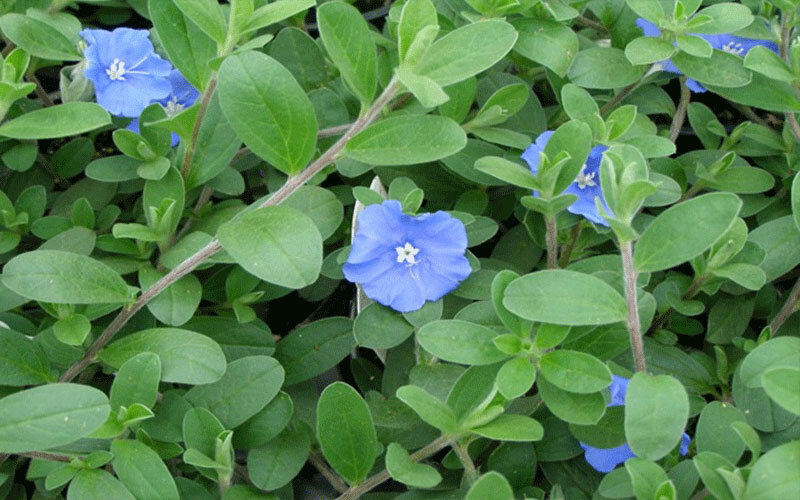 Blue Daze, a selection of Evolvulus glomeratus, can provide blue color throughout the hottest summer until the first frost. They work well planted toward the front of the border in this garden and used with other tough-as-nails flowers like the Profusion Fire zinnia. Light: Evolvulus does best in full sun, but can tolerate a little shade, especially at midday. Moisture: Evolvulus needs a well drained soil, but also frequent watering. It cannot tolerate wet soils at all, and very rainy periods or overwatering will cause fungus problems and lead to premature death. Evolvulus needs very little water in winter, and the humidity should be low when the temperature is low. Hardiness: USDA Zones 8 - 11. This is one plant that likes it hot! In areas that get frost, grow blue daze as an annual or in a container that can be brought inside. 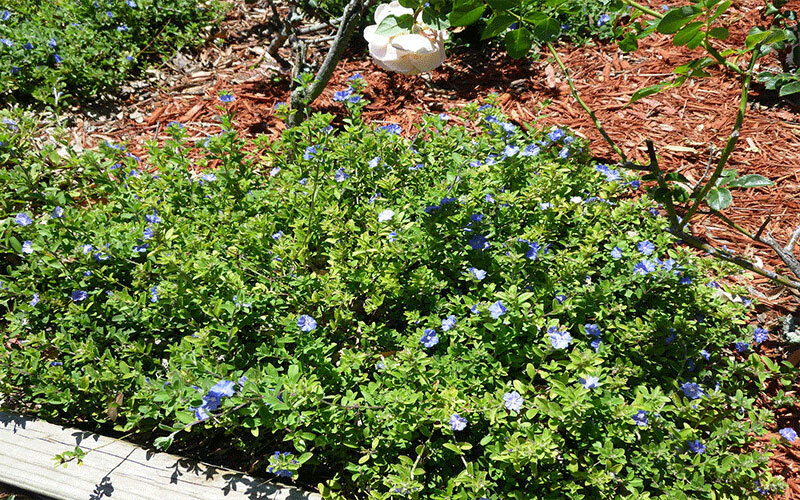 Some specimens of blue daze may survive light frosts, especially if they have been mulched. Step 1: Water your blue daze regularly during its first year of growth so that the soil remains moist. Once established, blue daze should only be watered when the top few inches of the soil dry out. In winter, when blue daze is not in bloom, water only during periods of drought. Step 2: Spread 3 inches of organic mulch around the base (but at least 4 inches away from the stem) of your bush. This will cut down on weed growth and help blue daze survive light frost. Step 3: Fertilize your blue daze lightly, once a month, during the growing season when it is producing flowers. Apply a 12-6-6 liquid fertilizer according to the manufacturer's recommended application rate for your blue daze's size. Step 4: Deadhead spent blossoms. This will encourage the blue daze to continue blooming all season.